“The RUSSIAN CONVOYS” Heroes of the Murmansk run–Allied seamen who fought Stukas, Nazi subs and frozen Artic seas in WWII. By B. B. Schofield. The Murmansk Run, most dangerous of all sea routes in World War II, was the vital supply line that helped defeat Germany’s armies in Russia. 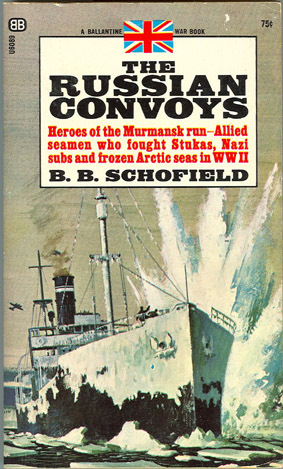 Here is the first full account of those merchant marine ships and their heroic crews. Attacked by land-based German Stuka dive bombers, trailed by aggressive U-boat wolf packs, these Allied seaman braved incredible risks in ice-choked northern seas. 1967 Paperback, 240 pages, 35 black and white photos, 6 maps, an appendix and index.